Last week, Kansas resident Makenze Bullins got an alert on her smartwatch telling her someone was at her door. 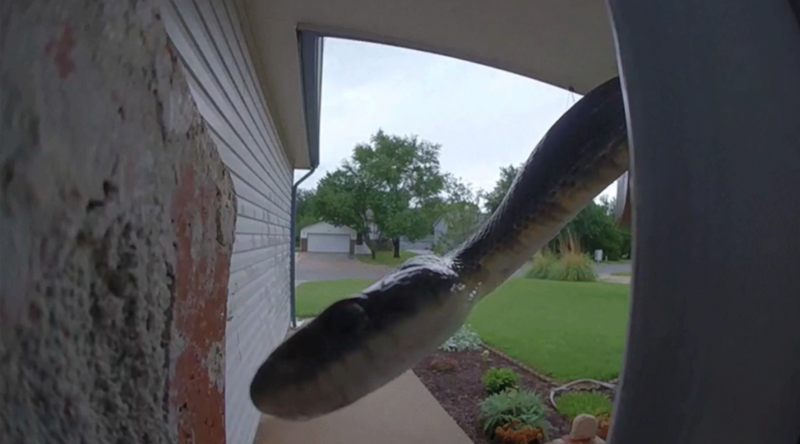 What she didn’t know then that her Nest Hello doorbell camera was actually picking up a friendly resident snake. Bullins told local CBS affiliate KWCH12 that she asked her husband to check it out, and when he looked at the footage he saw the cute reptile peeking into the camera, probably trying to find out if anyone was home. The snake continued to slither around the camera, which sent Bullins multiple alerts. Read more at Gizmodo.